Remember when Japanese horror movies were all the rage? Well, The Girl from the Well channels Japanese horror, a la` The Ring and The Grudge, and reinvents the story of the girl from down the well giving her a back story. 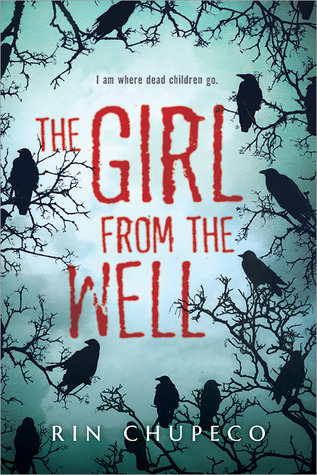 The Girl from the Well begins with the ghost killing a killer. It starts off very violently and honestly I was ready to DNF it right there. I wasn’t sure it was my thing, but I read on and I am glad I did! Rin Chupeco has a very distinctive style of writing and I think this style lent itself well to the horror story atmosphere. I also liked that the feeling she created wasn’t lost when the characters left America and visited Japan. I really enjoyed how Chupeco made a character who is made out to be a villain in the movies the heroine of this story. It was interesting to see more of her back story and discover how she came to be at the bottom of a well. I also liked the inclusion in the story of Japanese doll’s and Shinto exorcisms. It is something I’m not very familiar with and I loved watching the old and new Japan meet. Overall, The Girl from the Well was a dark and atmospheric novel. I enjoyed the setting, and found the story to be fresh and original. Her work, The Girl from the Well, is a YA psychological horror novel due out in Fall 2014, pitched as "Dexter" meets "The Grudge". She is represented by Nicole LaBombard and Rebecca Podos of the Helen Rees Agency. Wow, I've seen this book around, but I'd never really given a second look at it. It's definitely something that I'm interested in now. I never really read the synopsis, but now that I know it's borderline horror, I'm intrigued. The only Asian horror flick I've seen is The Grudge, and that scared the crap out of me. I'm definitely not a horror-oriented person, but this book just sounds so interesting. The Grudge scared me so much!! I am definitely not a horror movie person at all, but the book wasn't as scary as those movies (although the first chapter was super creepy). Excellent execution, with interesting action right up to the very end. After reading the sequel's two chapter tease, I gotta go it!